Haifa is the largest city in northern Israel. It's an attractive seaport and one of the most culturally mixed and cosmopolitan cities in the country. The Israeli saying 'Haifa works, Jerusalem prays, Tel Aviv plays' hints at the city's blue-collar roots. Regarding culture, the Haifa Theatre, the Krieger Centre for Performing Arts, and the Ein Hod artists' colony are all well-established and worth visiting. Haifa also hosts an annual (and well-attended) International Film Festival. There are numerous interesting attractions in the city, including a wealth of museums, gorgeous temples and mosques, and sunny, child-friendly beaches. For those fascinated with biblical history, Tel Megiddo - the supposed site of the end of the world - is located about 20 miles (32km) southwest of Haifa. 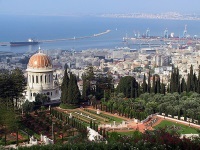 The majority of Haifa's visitors go there for the amazing gardens of the Baha'í World Centre, a UNESCO World Heritage Site once known as the Hanging Gardens of Haifa. This magical place has a golden shrine and lovingly maintained terraces, and is deemed by Baha'i followers as a 'gift to all humanity'. The beauty of the gardens and the amount of care that goes into their upkeep is both palpable and inspiring. They're one of Israel's most-visited tourist attractions, welcoming over half a million visitors every year.